Imagine a calming space that adapts to whoever’s inside it, breathes as they do, and changes shape and sound to fit their needs. This unique prototype from Philips and a co-creative team¹ of experts and academics aims to reduce work-related stress by altering people’s behavior naturally to encourage mindfulness. By walking around the space, a person intuitively chooses their own personalized experience. The concept is based on in-depth studies that show how reactive environments can help promote calmness. As well as in workplaces, this concept has potential for use in airports, hospitals, mental healthcare and other care facilities. Knowing that at least half of all lost working days are related to stress , Philips chose to explore work-related stress as part of its ongoing goal to innovate in health and wellbeing.² Studies show that people face increasing demands on their time and resources and the effect this has on individuals, the businesses they work for, and the healthcare systems that care for them, is huge. "Stress is both a taboo subject and a vague field for which there aren&apos;t many clear solutions. We wanted to use design to change people&apos;s behavior to help them become more aware of stress and how to deal with it." Luc Geurts, Creative Director at Philips Design Innovation and design lead on the project. To gather essential insights from the field, the project team worked closely with experts in mental health and well-being, as well as people who had experienced burnout through stress at work. Employees at the psychiatric healthcare institution GGZE in Eindhoven, who care for clients with severe mental health problems, were shadowed and interviewed. "What we discovered is how little attention caregivers pay to how they&apos;re feeling, so we thought right then that we wouldn&apos;t necessarily need a stress solution, so much as simply a means of holding up a mirror to people&apos;s emotions." Evelien van de Garde-Perik, lead researcher on the project from Eindhoven University of Technology. They also concluded that they wanted to design something that allowed the stressed person a sense of control over their situation, without giving them too many conscious choices that might make them feel worse. 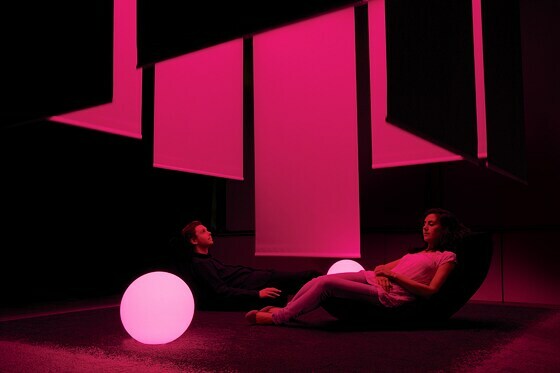 ¹ The concept of an ‘adaptive relaxation space’ was the result of a collaboration between Philips, the Design Academy Eindhoven, Delft University of Technology (TU Delft) and Eindhoven University of Technology (TU/e), funded by CRISP (Creative Industry Scientific Progamme). Read the Backgrounder to find out more about this co-creation project.